Island Dreams' Tina Robinette-Miller has just returned from Bonaire. (That's Tina above in the red dive skin). 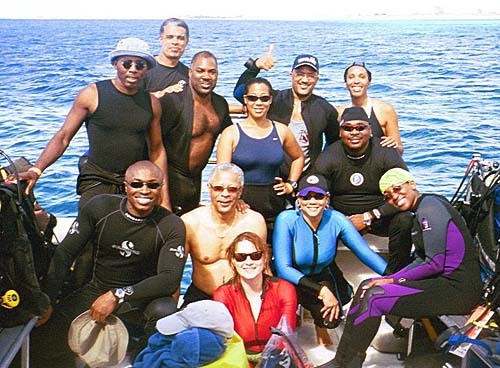 Her trip was the culmination of many months of planning and hard work, as Island Dreams was again tapped to handle arrangements for the annual "NABS Summit" sponsored by the National Association of Black Scuba Divers (NABS). We are honored to again have been of service to NABS, and hope you will find Tina's experiences and this report of value. A Really Big Group! - My recent trip to Bonaire really gave me an opportunity to check out Plaza Resort Bonaire and their in-house operator Toucan Diving. 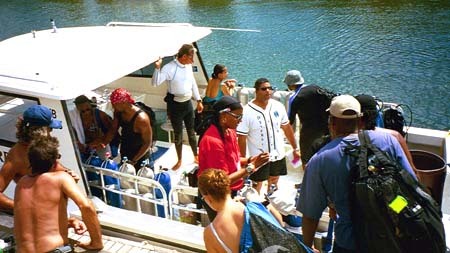 The fact that I was there to assist a group of 166 divers and snorkelers from the National Association of Black Scuba Divers (NABS) meant that this resort and dive operation had to be at the top of their game. Toucan Diving - The staff of Toucan Diving proved to be well organized and very helpful. Coordinating 146 divers on five boats with both morning and afternoon departures worked out about as seamlessly as I ever could have hoped with a group of this size. Prior to the first dive, each certified diver was obliged to pay the marine park fee of $10USD in cash and watch a 40-minute video about the marine park and its preservation. Once a checkout dive had been accomplished, our divers were ready to hit the water from one of Toucan's comfortable dive boats. Plaza Resort Bonaire - Plaza Resort Bonaire proved to be equally accommodating. Spread across expansive grounds, the resort offers multiple levels of accommodations to handle single travelers, couples and even families in multi room villas. All rooms are an easy walk from the restaurants and bars, though some guests felt the villas were a bit of a distance from the dive shop. The Lodging - While there I inspected a number of different room styles at Plaza Resort Bonaire. Each is spacious with ample room for spreading out your luggage and dive gear. The bathrooms are over-sized with a shower and bath configuration and are equipped with a small amenity pack and hair dryer. Each room has both a dresser and extra large closet for all your items. For your convenience and protection, the closet includes a small safe. Space abounds in these rooms is all I can say! The Dining - Meals were well organized and service was fast and friendly with a nice variety of items. Breakfast was a buffet with cold cereals, fruits, breads, pastries and chafing dishes of scrambled eggs, bacon, sausage, waffles and pancakes. For lunch items such as hamburgers, salads, sandwiches and even hot dogs for the kids are on the menu. Dinner included a variety of Danish dishes, U.S. style foods, and even a few Indonesian items. Prices were not much more than you would find in the US. Even a Casino - Although the Casino was closed during my stay (to accommodate the NABS meeting requirements) it normally offers slot machines, roulette and black jack tables. Maybe lucky for me it was closed?! A Great NABS Summit - I'm happy to report that the big NABS trip turned out to be a great success. Many of the club members felt it was their best trip ever. Even though we had sold out the entire resort, never in the week did we ever feel crowded or lacking for service. Plaza Resort Bonaire and Toucan Diving offered us great service, great food and great can-do attitude throughout the week. What more could a dive traveler wish for? The Bottom Line - I was very impressed with the services provided by Plaza Resort and Toucan Diving and really loved the island of Bonaire. It is a great dive destination, made even better with it's unique shore diving opportunities. Divers of all skill levels will enjoy Bonaire's pristine dive sites offering a cornucopia of reefs, wrecks, and walls. As for the lodging and diving, I can't think of a better choice than the companies that so ably served our big NABS group. If you have any questions, feel free to run them by me, or just drop me a line when you are ready to see and enjoy Bonaire for yourself! Like more info about Bonaire? Additional Resources: Island Dreams has dedicated color brochures for the various Bonaire resorts. You are invited to call or e-mail for additional information, advice, or assistance with bookings and airfares.